When you head out for a hike on the trail or a walk in the woods, make sure you're ready with the right outerwear, including this Wrangler Men's Black MJK018X Fleece-Lined Trail Vest. It will help keep you warm and dry without the bulk of a long-sleeve jacket or co ... (see full details) (see specifications) #MJK018X. When you head out for a hike on the trail or a walk in the woods, make sure you're ready with the right outerwear, including this Wrangler Men's Black MJK018X Fleece-Lined Trail Vest. It will help keep you warm and dry without the bulk of a long-sleeve jacket or coat, offering freedom of movement plus protection from the elements. Crafted of 95% polyester and 5% spandex, this men's vest offers durability in a lightweight package, with the added benefit of some flex, thanks to the spandex. Go ahead and move -- bend, flex, twist, and turn, and you'll get no argument from this sleeveless vest. Wear it alone or other outwear for added warmth. It's built to help keep you warm and dry with a water-resistant finish to keep the damp away and a fleece lining to help trap your body heat and keep you warmer. When it comes to looks, you can't beat this Wrangler sleeveless jacket for men. The body is black, so it goes with everything. Pops of blue on the side panels, collar, and zippers add some flair. For versatility, it's constructed with an adjustable drawcord waist that allows you to adjust the fit. The vest zips at the front and features plenty of pockets for warming your hands and stowing all the essentials you need on the trail. The exterior features a zippered vertical pocket on the chest plus two lower front pockets that also zip. Inside, there's an additional zippered pocket for additional secure storage. You'll have plenty of spots for keys, phone, and essential gear. Slip into the perfect combination of warmth, ease of mobility, and style with this Wrangler Men's Black MJK018X Fleece-Lined Trail Vest. 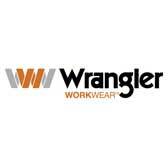 Order one today from your Wrangler outfitters right here at Working Person’s Store today. I have always been able to work with Jackie easily. She is really nice. I like her. She always gets my orders out fast. Our crews are always busy and Working Person's Store has become a favorite. Wrangler Vests: Men's Black MJK018X Fleece-Lined Trail Vest is being added to your cart.